Before you announce the software product that you developed, nobody knows about it. Actually if you are starting in the business, maybe nobody knows you yet. So you need to start attracting people to at least try your product, demonstrate that you understand about the user problems and how your product can solve them. Watch this video of a consulting session to learn about means to start attracting a list of people potentially interested in your product, so you can sell it later to them. Lets say that you have developed a great software product. When it is ready, you need to start attracting your first users. In general, your product will not just sell by itself if you do not make an effort to expose the product to the world in a way that your target users see it and eventually get interested to learn more about it. Watch the video below to learn about how you can get started to promote your product and get tour first users, starting eventually with a low budget. Now you can also get free consulting sessions over Skype to get advice on how to solve specific software product business problems that you maybe having, so you can become more confident and get on with your business without fear. Just join this Facebook group called Fix My Software Product Business and ask your questions there. At the top of this group there is a post that tells you how you can apply to get a free consulting session without revealing your identity if you prefer. The only condition is that you allow the sessions to be recorded, but your name and image will not appear and your voice will be distorted in case you want to keep your identity secret to protect your business. My goal is to build a community of successful developers that not only create nices software that they like, but also are independent and have autonomy to work on what you want. As a community we can help each other and be more successful then when we work alone. 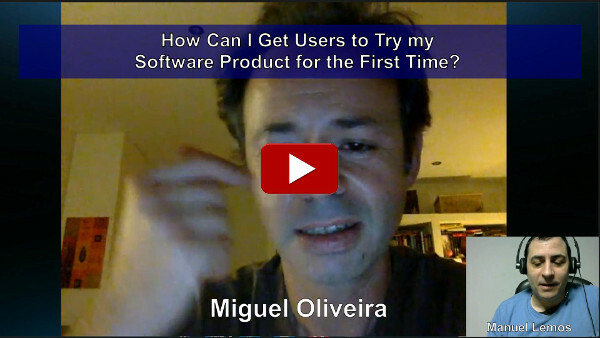 The next video will about how can you get users to try your software product for the first time. It tells you about wants that you start building a community of users even before you launch your product, so you can sell it later.